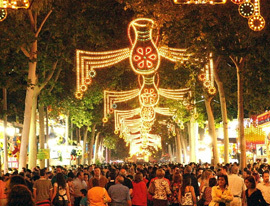 Over 3 days, it will be possible to tour the world without going any further than Fuengirola fairground. The Feria Internacional de los Pueblos 2011 – an international food, drink and music fair – starts tomorrow (Friday) and continues until May 2. The fair is now in its 17th edition and has become one of the most important of its kind in Spain, attracting visitors from near and far, with more than one million expected. The official inauguration will take place tomorrow at 8.30pm at the Palacio de la Paz, in the fairground, and on Saturday at midday, the participating groups will parade through the local streets from the town hall to the fairground. It will include classic cars and Harley Davidson’s representing the USA. This year, participating countries and Spanish regions are: Argentina, Asturias, Brazil, Bulgaria, Cadiz, Chile, Colombia, Cuba, Dominican Republic, Ecuador, Egypt, Fuengirola, Galicia, Germany, Greece, Hawaii, Hungary, India, Ireland, Israel, Japan, Morocco, Mexico, Norway, Palestine, Paraguay, Persia, Peru, Scotland, Thailand, United States, Uruguay and Venezuela. The fair will be open every daily from 1pm to 4am.